This week the American currency has been declining against major currencies, including the Yen. The decline in the USD is associated with the negative macro-economic statistics on retail sales, key indices and US industrial production. At the same time, Japanese currency has received support from economic news. Investors started to take profit on long positions, which decreases demand for the USD. Today, the pair is moving in the narrow range of 119.10-119.50. Today’s economic news will include the data on the US construction sector, labor market and US manufacturing production. It is expected that tomorrow American indices will be positive. In addition, Japanese consumer confidence index will be known. Although this index fell in February, it is expected to increase in March. It is expected that following slight decline, the price of the USD will increase. The pair has dropped to the key support level of 119.10; now it is possible that the price will reverse and the USD will go up. 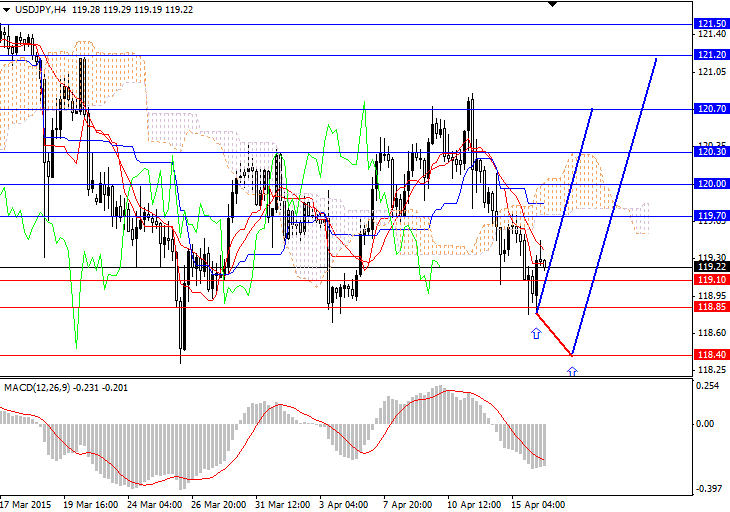 In the medium-term the rise in the pair can reach the levels of 120.30 and 120.70. Breakdown of these levels will open the way to the local highs of 122.00. Support levels: 119.10, 118.85, 118.40, 118.00 and 117.70. It is recommended to open long positions at the current price and pending long positions from the level of 118.40, with take profit of 120.70 and 122.00 and stop-loss at 118.00.